Yum! I love this combo for a February soup night. Nothing says comfort like tomato soup, especially when paired with a variety of grilled cheese sandwiches! Cut up good bread into crouton bite sizes, drizzle with olive oil, add salt and pepper and parmesan cheese and toss. Bake in oven til toasted and crunchy. Sprinkle soup with Crotons, finely cut up basil and parmesan cheese. Mix sour cream with finely chopped basil and/or chives and add dollop of sour cream to each bowl of soup. 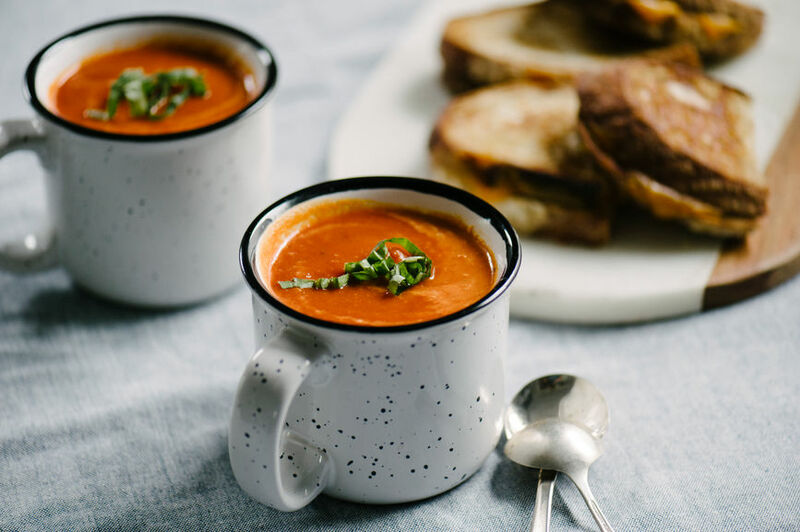 Accompany soup with Grilled Cheese Sandwiches. In a large stockpot, heat the olive oil and butter over medium-low heat til butter melts. Add onion and carrots, dash of salt and pepper and cook vegetables still just tender. Add in tomato paste and chopped garlic and cook til blended and garlic is soft. Add the tomatoes with juice, broth and thyme, a few red pepper flakes and sugar. Cook tomatoes on medium high heat (don’t allow to boil) til they have broken down and soft, about 40 minutes. Use an immersion blender and blend til smooth. Add add’l broth if too thick. (I like immersion blender best, less messy and less time it takes to blend the soup til smooth in a regular blender) Don’t worry if there are little bits of tomato or other vegetables still in soup (it’s rustic) unless you like it completely smooth. Reheat soup on medium low heat til cheese has melted and blends in with soup. Serve warm. Garnish with basil/parsley mixture or any of the other garnishes or other preference. I serve the soup with Grilled Cheese Sandwiches. The soup is delicious served alone as well! Butter the other 4 slices bread on one side and place unbuttered side on top of cheese. Preheat oven on low broil. 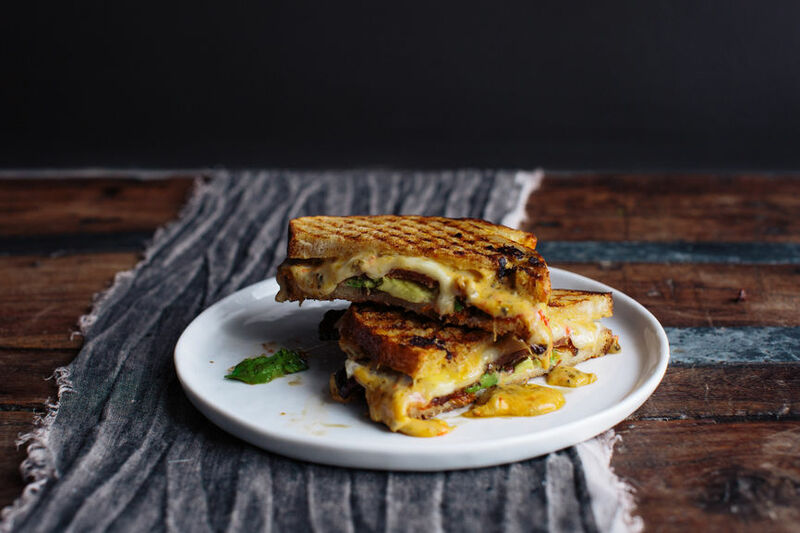 Place each sandwich on a baking sheet and toast each sandwich til just brown and cheese has begun to melt. Open oven and gently flip sandwiches to broil other side til just brown and toasted and cheese had melted. Serve warm with Rustic Tomato Soup and a dill pickle or other preference. Combine Cream Cheese, Blue Cheese Crumbles and green onion in a bowl. In a pan cook pancetta til done and slightly crispy. Add to cheese mixture. Butter one side of 4 slices of the bread. Spread Cheese mixture on unbuttered side. Butter one side of the other 4 slices of bread and place the unbuttered side on top of the cheese. Place sandwiches on baking sheet and broil til slightly toasted and brown. Gently flip and broil til slightly taoasted and brown. Brush one side of bread with butter mixture. Pat tomato on paper towel to decrease any extra water Place a slice of Provolone Cheese on bread, then tomato slice and then Swiss Cheese Spread pesto mixture on other side of bread and place on top of Cheese. Brush butter mixture on the other side of bread. Place sandwiches on a baking sheet and broil til toasted and slightly brown. Gently flip sandwich over and broil til toasted and slight brown. Enjoy with Rustic Tomato Soup.